In the market for a used policeman? That second-hand constable could be stolen. Thefts of policemen are on the increase as criminals target serving officers to sell on the black market. 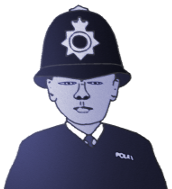 Police forces in the UK periodically sell off surplus policemen, but only through authorised outlets. That way they can ensure that all officers offered to the public are fully tested and compliant with current regulations. If you should find a policeman being sold at a market, second-hand shop or car boot sale, the chances are that it's faulty, dangerous or bent. It might not even be a policeman at all, merely a reconditioned traffic warden or two car park attendants welded together. So, if you're looking to purchase a cheap second-hand policeman, make sure you choose a retailer displaying the Copwatch sign. 'Evening all. Your average criminal is a shifty fellow and he has all sorts of tricks to hoodwink you, the unsuspecting consumb... cucumber... consumer, into parting with your hard-earned lolly. But if you stay sharp you can spot these three tell-tale signs that mark out a real constable from a ropey old bit of tat. 1. Always check the truncheon is intact. UK law prohibits the sale of policemen without a functioning truncheon. No truncheon, no sale. 2. Examine the helmet for cracks. Most policemen's helmets will have scratches or scuffs - this is normal wear and tear. However, cracks, splits or significant deformations could indicate that the officer has been in a serious accident and could be a write off. 3. Ask him the time. Everyone knows that if you want to know the time you should ask a policeman, as they are all calibrated to Greenwich Mean Time. Failing this simple test could indicate that the officer is a fake, or his battery is flat. Finally, if you have recently bought a second-hand policeman and you think there may be something amiss, you can take it along to your local nick where the desk sergeant will look in its special secret place for its registration number. Want to know how much to pay for a 'Nigel Tomlinson'? Maisy Donnington brings your blood pressure down.